Can be decorated to suit any number of uses! Featuring lids with heart-shaped cutouts, these unfinished boxes can be decorated to suit any number of uses. The top lifts off easily and fits securely. Pack of 6. 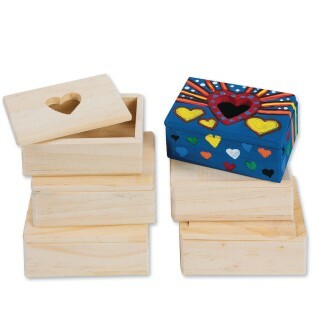 Box measures 3-3/8” x 2-1/2” x 1-3/8”. Decorating supplies sold separately.